With the beginning of December comes Christmas. The perfect holiday to bake cookies! Some people enjoy this tradition, but others might find it tedious and unrewarding. For those of you who don’t have the time or skill to bake or don’t like to fill up on too many sweet goodies during Christmas, we have the perfect solution. 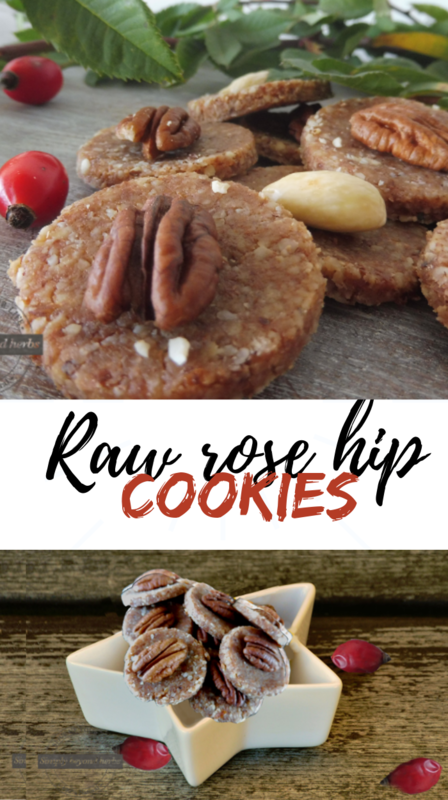 These raw Rose hip cookies require only two simple ingredients, they are easy to make and most importantly, they are healthier than any other traditional cookies. What’s more is they don’t contain any flour or sugar and they aren’t even baked. Even though raw Rose hip cookies are not fancy they can help give your table a nice holiday vibe. and keep your stomach satisfied. I made them for my nephew who is 11 years old and has an insatiable sweet tooth. Unfortunately 3 years ago, doctors diagnosed him with type 1 diabetes and our whole family struggles to prepare meals adequate to his new diet. Here we go. These rose hip cookies were a success. He loved them and could eat as many as he wanted. Raw rose hip cookies are gluten free, paleo and low carb, they’re healthy and delicious. What do you need to make your desired rose hip cookies? The two ingredients that make these cookies an outstanding success are almond flour and rose hip jam, their medicinal benefits and great taste are what makes them so special. I made a whole post about the benefits and techniques on how to make rose hip jam. Made of ground almonds, almond flour is incredibly nutritious, it is particularly rich in vitamin E and magnesium. It is also naturally low in carbohydrates, it is even gluten-free so it is suitable for people with diabetes, celiac disease or a wheat intolerance. Can I replace the rose hip jam with other kind of jams? yes, you can use other types but than it will not be rose hip cookies but other kind of cookies. Just make sure the jam structure is rather liquid than solid. Can I replace the almond flour with other flour? How long will last raw rose hip cookies? They last couple of weeks. Just keep them in the closed box in the fridge. No need to refrigerate them. since we don’t use any eggs in this recipe as well as flour these raw rose hip cookies are very safe to eat unbaked. We are lucky to have a huge selection of ingredients to choose from when it comes to Christmas cookies making. Where did the first Christmas cookies come from? Hundreds of years ago when people were poor and sugar and flour were very rare, they made their first cookies out of dried fruits and a large quantity of honey. Sugar as well as other spices came into play in medieval times when we started mounting expeditions to Asia, Africa and the Americas. Spices like cinnamon, nutmeg, almonds and black pepper began to emerge. Together with dried exotic fruits like citrus fruits, apricots and dates added sweetness and texture to desserts. Probably the first cake that was associated with the Christmas season was the honey cake. It was prepared by monks from the monasteries in Nuremberg, Germany. They made honey-sweetened cake, mixed with spices to support digestion – cardamom, nutmeg, cinnamon, ginger, coriander, cloves and pepper. as “cookies” arrived with Dutch immigrants to America. Every year before Christmas, Traditional Christmas aromas and spices – vanilla, cinnamon or cloves and many others, fill kitchens around the world. We have plenty of herbs and spices at our disposal that sometimes it’s complicated to choose the right ones. What herbs, other than rose hips, belong to Christmas? – comes from the eastern Mediterranean region and Southwest Asia and is one of the oldest and most widespread spices. Anise relieves coughing, accelerates digestion, promotes appetite and reduces flatulence. And above all, seeds of anise are popular for their sweet taste and peculiar smell in Christmas cookies and gingerbread mixture. – is a spice that not only smells amazing (resembling anise) but also looks beautiful. They are mostly small eight-pointed stars from which the shiny brown seeds peek out. Badian anise has been growing in China for 3,000 years. It came to Europe in the 16th century. Badian anise essential oil is used in the production of liqueurs and perfumes, otherwise this spice is popular in Asian cuisine and cannot be missed in Gingerbread mixtures. People were using this spice since ancient times. The characteristic shape of the clove comes from the drying of the undiluted buds of tropical cloves, that grow today in many humid tropical countries. It gives it’s generic taste to welded wine, It is also part of curry spice. Its exotic name gives us a clue that it comes from far forests in India, Ceylon, Sumatra, and China. His greatest popularity was in the countries of the Orient, where they add not only to meals, but also to tea and coffee. Small wrinkled seeds melt into powder and because they smell a bit of lemon, they are used in making pastries as well as liqueur production. This spice, which can be grown in Europe. Sugar-coated fennel seeds were used against abdominal pain. It has indeed been confirmed that its essential oils act against harmful bacteria in the gastrointestinal tract and stimulate digestion. In some kitchens they use fresh leaves, the mature fruits are pleasantly aromatic, they have a sweet, spicy flavor, which in a small amount is perfect for making pastries. These pepper-like spice come from tropical America. The original inhabitants knew him long before the arrival of European conquerors. Use to season a chocolate in both – solid or liquid form. The name all spice includes itself the combination of the flavor and aroma of the most popular exotic spices – pepper, cloves, cinnamon and nutmeg. comes from the aromatic bark of Asian tropical trees. Not only in ancient Egypt, but also in Greece and Rome, they attributed her a great and mysterious power. Without cinnamon today, we can not imagine preparing hot Christmas drinks such as mulled wine or punch, adding to a variety of liqueurs and, of course, not missing out on a great variety of desserts and delicious pastries. originally from West Asia, Saffron gradually reached Europe, where it grows in Spain and southern France. We use dry blossoms of saffron flower for their very intense scent and color – the food or pastry turns bright yellow to orange. Old Toltec and Aztecs tribes used it as a fragrant ingredient in popular beverages from cocoa beans and chocolate pies. They believed that vanilla strengthens the heart, removes fatigue, exfoliates fear, and adds strength and health overall. Fermented vanilla pods, which are tropical orchid fruits, were brought to Europe by Spanish conquerors in the 16th century. We can artificially produce the main substance called vanillin, which causes this amazing scent, but experts say it can never replace the natural product. simple, straightforward and delicious yet healthy and packed with vitamins these raw rose hips cookies are gluten free, paleo and low carb. Made of almond flour and rose hips jam they will satisfy your sweet tooth and beautifully decorate your Christmas table. Mix required quantity of rose hip jam with almond flour and fold until smooth. Divide dough into two rounds and roll each out to 1/4 inch (5 mm) thick. Cut the different shapes out of the other round. Place dough in the freezer for at least ten minutes before you start the rolling— this step is optional but will allow you to form more perfect balls of dough for “prettier” cookies. I can’t wait to try these! Rosehips are so yummy and good for you! This recipe looks so easy, too!! Thank you for sharing! These look SO yummy! I used to grow rugosas which produced monster hips for jelly. Every place we move, I plant more rugosas. I need to stay put long enough to harvest again! I’ll keep this recipe until then – should be next year, if I planted them correctly. These sound so yummy and look so pretty! Thank you so much for sharing this recipe! These look delicious! Passing this post along to my diabetic family members who are looking for healthier alternatives. I have two brothers with diabetes and I love that you mentioned that this is a great recipe for them!!! I always feel bad when they miss out!